154 Hidden Court: My eyes! My eyes! Share one of your "did that really just happen to me" life moments. This is a really long post. Sorry. In my defense though, it's also a really long story. So there's that. In the midst of the craziness that is Christmas morning with two little boys, my husband pulled a single gift bag out from under the tree. "I only got you one thing this year," he said, almost apologetically. "And it's for your birthday, too." Since my birthday is just a few weeks after Christmas, this is not unheard of, nor is it something to apologize for, necessarily. When I took the bag, I thought for just a moment that it was empty, but upon opening it I realized that it contained a single piece of paper. It was a gift certificate for LASIK surgery. I've been tied to my glasses for the better part of 30 years, and my desire to get rid of them has been around almost that long. It's not a cosmetic thing. It's never been a vanity issue. Seriously, I'm one of the least vain people I know. I never minded how I look in them, but they're thick and heavy and my nose sports a permanent bump where they've rested for decades. My desire for LASIK has increased dramatically since having my two very active, very daredevil-like little boys. I want to be able to keep up with them. I want to ride all the rides and run into the ocean and play in the rain and go down the BIGGEST water slides without fear of losing my glasses - or worse, without them on and without being able to see what's happening to me. It's scary not being able to see. I thought this would be the last picture of me in my glasses. Also, I realized on the way out that I was in the men's room. Oops. I TOLD you I was nervous. When I arrived at the surgical center, I was a nervous wreck. I don't do doctors much. I prefer the martyr route whenever possible, and elective surgery is so far out of my comfort zone it all seemed surreal in my mind. But I have promised myself to practice more self-care this year, and this surgery was completely in keeping with that. I was taken back to the surgical waiting room the get prepped, and when the intake nurse asked me if I wanted the "nerve pill" before surgery I laughed hysterically for just a minute then said in all seriousness, "Can I have two?" I had read lots and lots and lots about what to expect (and the "nerve pill" calmed me down dramatically) so I was cool as a stir fried cucumber when I laid down on the table. The doctor started the procedure on the right eye and even in my totally blind, nerve pill induced state of floating I could tell by the tone of his voice that everything was not necessarily going according to plan. He started the left eye and just a minute into the surgery I heard him say, "I'm not going to be able to complete the procedure on this eye." This was definitely not going according to plan. They got me upright and into a room to "rest for a few minutes" and the doctor finally came in and talked to me about what went wrong. I apparently have a condition called Epithelial Basement Membrane Dystrophy which, long story short, means that when they were doing the surgery, my corneas, which should have remained attached, were possibly floating around the OR until someone could catch them and shove them back into my eyes. It's a genetic condition, usually asymptomatic (except for dry eyes, oops) and is usually never detected or diagnosed unless there is trauma to the eye. You know, trauma like, say, LASIK. Follow up appointments were made (SO. MANY. APPOINTMENTS.) and I was told that my vision would most definitely not be improving by tomorrow. Or by next week. As a matter of fact, it could be months before we got all this sorted out. The entire time, I'm sitting there thinking "Seriously? This is happening? REALLY?!?!? I'm going to be functionally blind for MONTHS?!?!?!!?" It's possible I may have had a slight meltdown in which it's possible I may have shrieked "You blinded me! And I paid you to do it!" and it's possible I may have received a, um, refund. I guess blinding is free. But whatever. The next week was possibly one of my least favorite in memory. I couldn't see to read. I couldn't see to watch tv. I couldn't see to do normal household/life functions like preparing meals, or doing laundry, or plucking those chin hairs that spring up overnight. I couldn't see. My computer just looked like a big gray blob. My kids were just blurs of color and noise. I did listen to a couple audio books and I could see to use my iPhone if I held it exactly 4.5 inches from my left eye and closed my right one. I took full advantage of that by taking about a million pics of myself in various states of eye wear. See? At one of my (many) follow-up appointments, right after my doc told me with something akin to awe and glee that he's been doing this for decades and mine was BY FAR the worst case that he's ever seen of this particular condition, then started quibbling with me about when I needed to come back for my next follow-up appointment, I may have (mis)quoted some Blanche DuBois ("I am currently dependent on the kindness of strangers to get me places!!!") and it's possible that he thought that was extremely funny and it's possible that now I just get to show up whenever I feel like it with the promise that he will see me immediately. In any event, what was supposed to be a really quick thing that changed my quality of life for the better has - so far - not been. I'm two weeks past surgery now, and my vision is slowly improving in my right eye, and slowly getting back to it's former (horrible) vision in my left eye. The biggest problem I have at the moment is that my eyes don'r work well together because of the huge difference in vision that I have in each one. It has occurred to me that this is sort of a recurring theme in my life. I usually eventually get to where I want to be, but it's NEVER a straight shot from point A to point B. That would be too easy, and I apparently don't do easy. But even though I know that, I'm still sitting here, functionally blind in one eye and unable to see out of the other, wondering, "What the HELL just happened?" I think that you totally rock the eye patch. 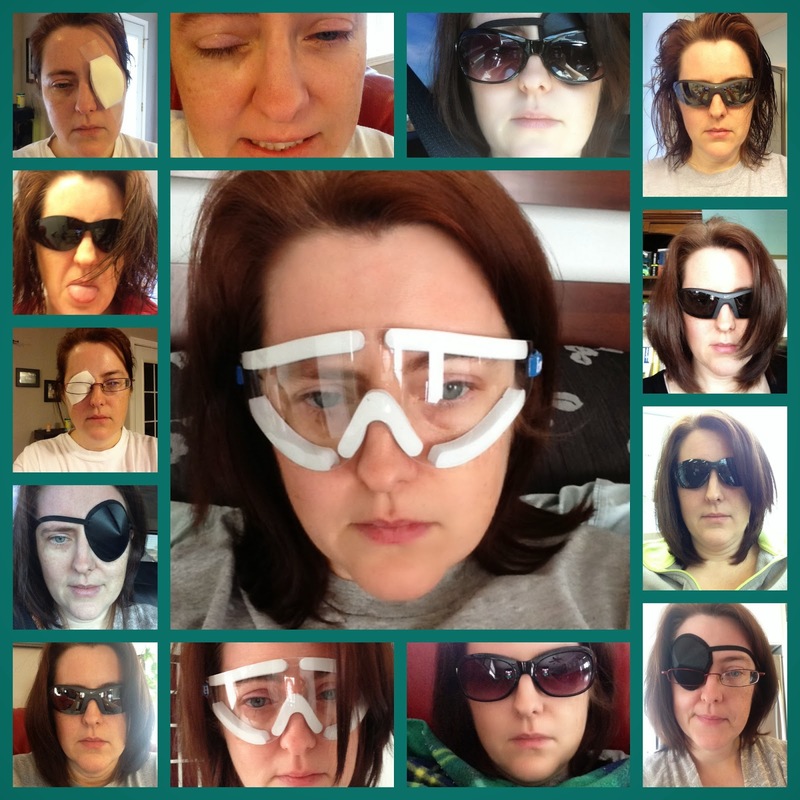 Seriously--your story is one of the reasons that I haven't had LASIK surgery. If there is an obscure condition that would show up in the middle of surgery, it would happen to me, too! I hope that everything turns out well! Yes. If there is a hard way to get somewhere that's the way I will take. Every time.